Retro Gaming The 70s & 80s: Dungeon! 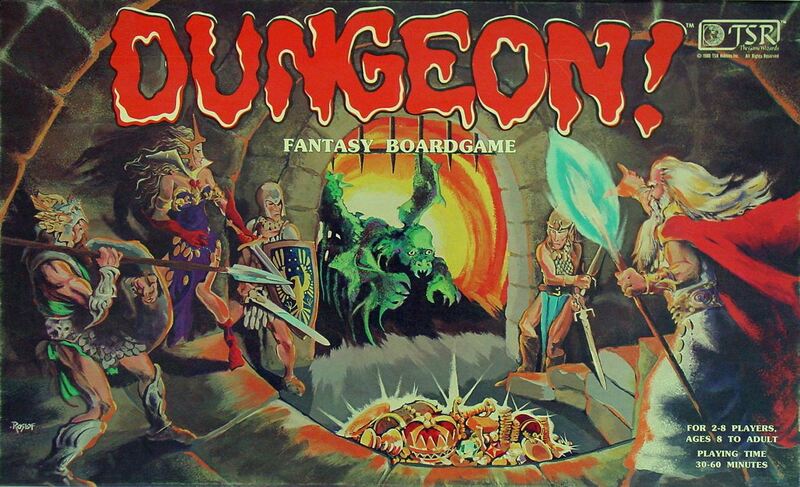 In 1975, just a year after the release of Dungeons & Dragons, TSR Hobbies released the boardgame Dungeon!. The game mirrored many aspects of D&D’s dungeon-crawling framework while offering a much lower point of entry for players either new to the genre or looking to just play a quick game. I got a copy of Dungeon! after a couple years of spending hours playing D&D and painting my first lead miniatures from the likes of Ral Partha. Dungeon! offered a traditional boardgame format and came as an occasional break from the open-ended role-playing my friends and I were used to with D&D. 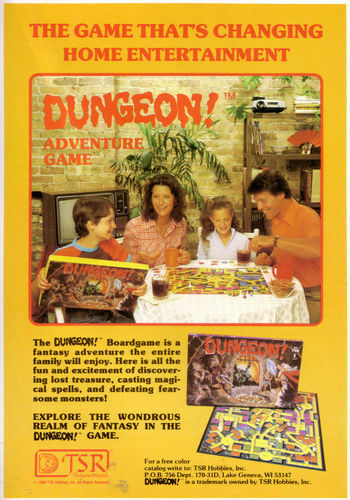 Ads for the game at the time (left) were also pitching the game to families and casual gamers as a point of entry and enticement to the larger world D&D offered. Playing as an Elf, Hero, Superhero or Wizard, players moved through six progressively-difficult levels, encountered random monsters and collected treasure. Each character class carried specific strengths and powers, with more powerful characters such as the Wizard or Superhero requiring greater treasure to win the game. Large chambers such as the Kitchen, Crypt, King’s Library or Queen’s Treasure Room were surrounded by smaller rooms, color-coded to indicate the level. In each large chamber, a stack of three randomized monster cards specific to that level were placed at the beginning at the game. In each smaller room, one monster and a treasure was placed. When a space was entered, the top card was drawn and combat between the player and the monster ensued with a simple die roll. Winning combat won the treasure while ties or losses might result in a retreat or loss of treasure. For players familiar with D&D like myself, Dungeon! mirrored a lot of the established canon. Monsters fell along the lines of hobgoblins, werewolves, dragons, mummies and snakes. Dungeon pitfalls such as traps might be encountered. Characters like Wizards held special spell cards such as Fireball or Teleport, and found magic items included an ESP Medallion and a Magic Sword, offering certain characters bonuses to their play. Treasure ranged from meager bags of glod found in the easy levels to the covtted Huge Diamond (worth 10,000 points) hidden deep in the sixth level. Several editions of Dungeon! followed through the years, the most recent in 2012 from Wizards of the Coast, now-owners of the D&D franchise. Longtime players have also created a rich universe of house rules, customized boards and even hand-painted figures to supplement the basics of the game. Despite its relative ease of play, Dungeon! has remained a classic bit of fun among even the most serious gamers today.